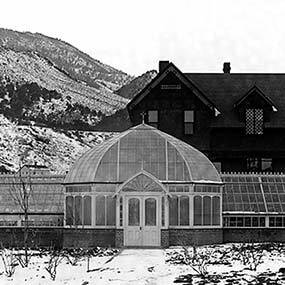 Jerome B. Wheeler became famous and wealthy in banking, mining, and railroad interests locally and in Aspen, Colorado. 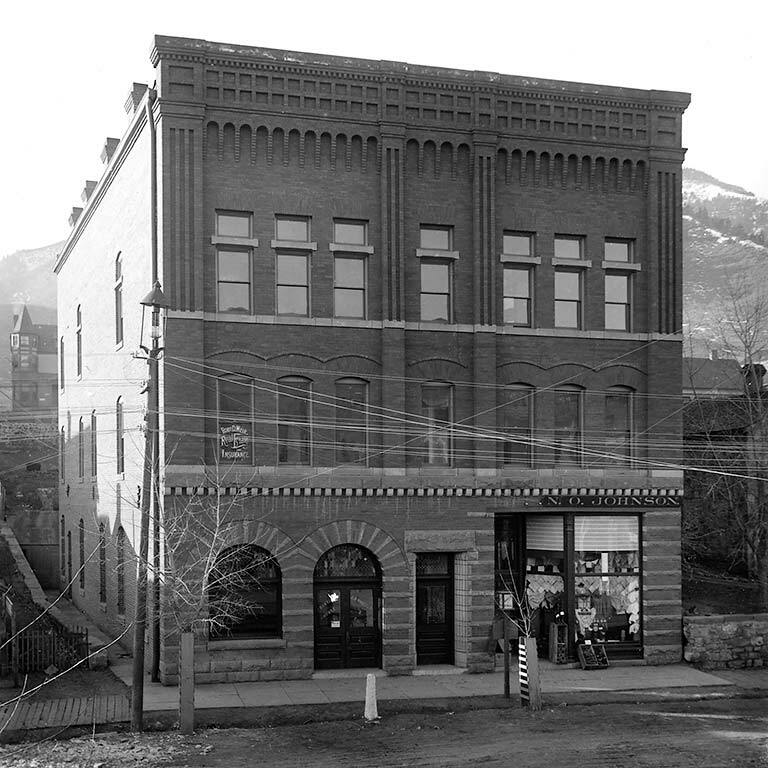 He founded Manitou Spring’s first bank in 1859 and first fire department in 1892. He provided several, large monetary gifts to build and improve the city's streets. Manitou’s town clock was also a gift from the Wheeler family. Wheeler Spring was drilled around 1920 by Jerome’s son-in-law, here at the corner of the grounds of his home, Windermere. 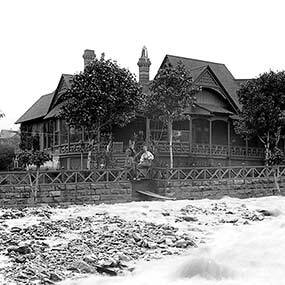 The expansive house was located just behind this font where the Post Office now stands. 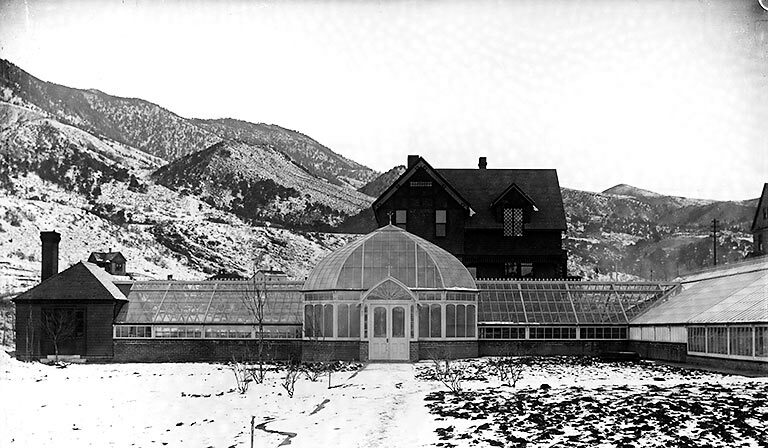 A short distance to the west (left), some of the buildings on Wheeler's estate originally contained a bowling alley and shooting range, and several still exist today as the Wheeler House, now owned by the Cliff House. 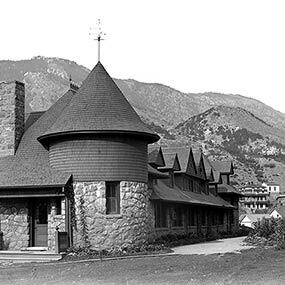 Manitou Spring’s most elegant hotel is located just across the street to the east (right) of Wheeler Spring — the Cliff House. Throughout its long and fascinating history, hotel guests have strolled down these sidewalks and sampled the spring waters on their way downtown, or to concerts and other events in Soda Springs Park, behind and just across the street to your left. 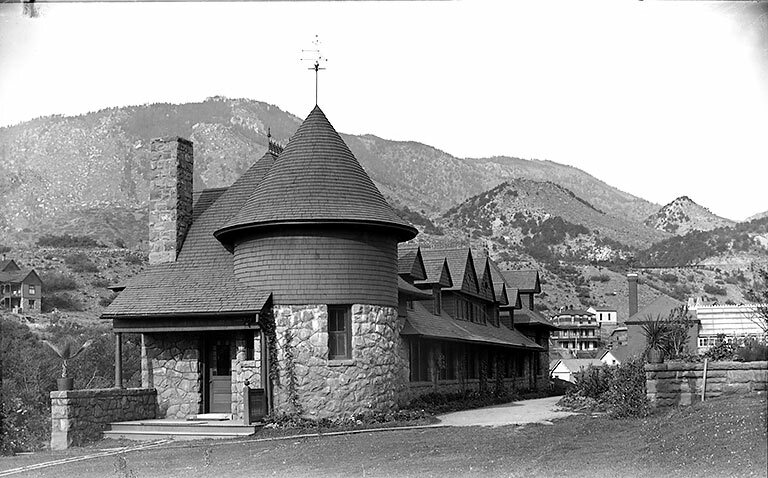 Theodore Roosevelt, Henry Ford, and Harvey Firestone are among the many guests of note to have vacationed at the Cliff House. 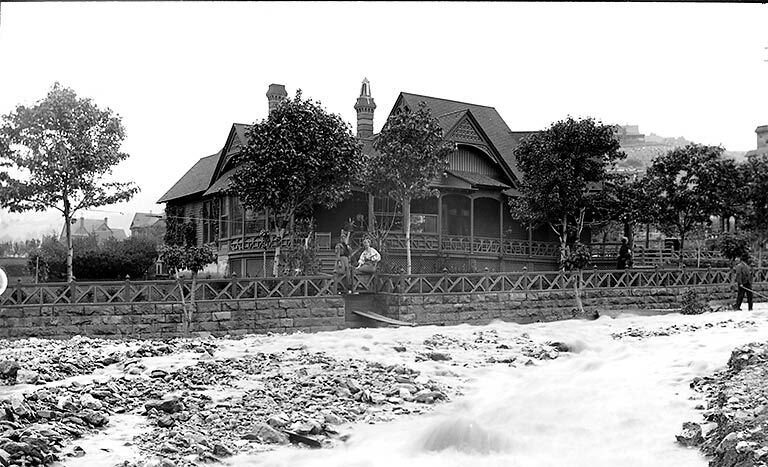 Like many of Manitou's springs, Wheeler Spring used to erupt at regular intervals when the carbonation in the water built up enough pressure to force it from the well. 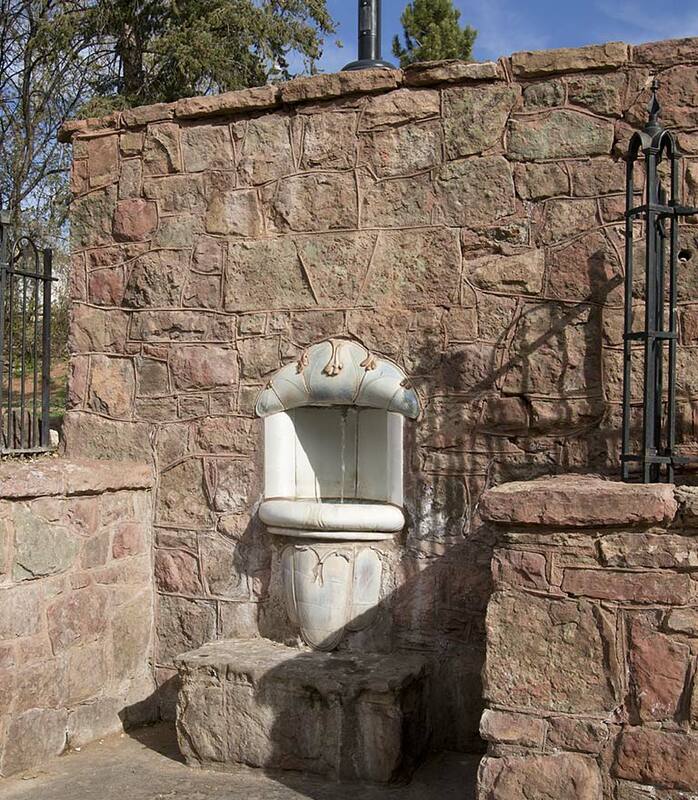 Restored in 1989 by the City of Manitou Springs and the Mineral Springs Foundation with a font designed by Randy Bowen, the water is now regulated to a steady flow to allow for easy filling of containers. Black Forest artist, Randy Bowen, established his studio in Colorado Springs in 1980. His work includes abstract sculpture, architectural pieces, and functional stoneware pottery. 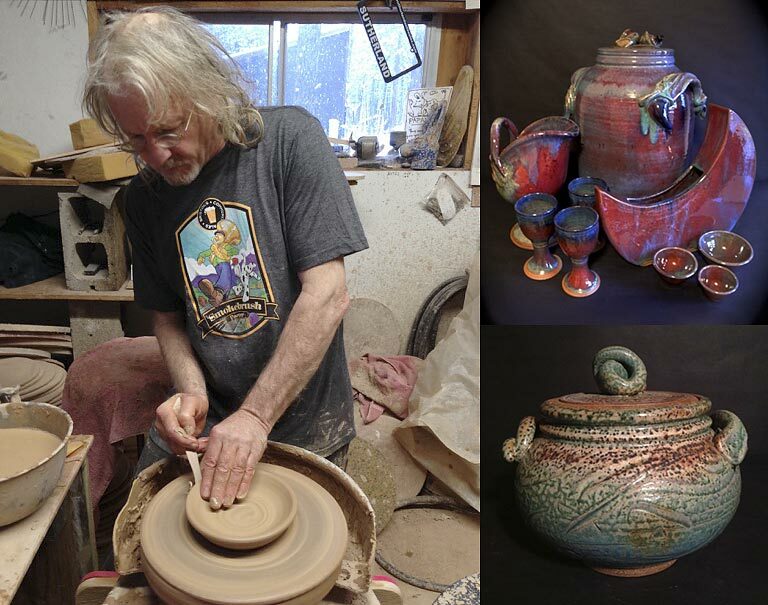 Mr. Bowen has been featured in regional art exhibits and galleries, and his work is available year-round at Bowen Pottery, Black Forest, Colorado. Calcium is the mineral the body uses most, a critical building block for bone and tooth formation. Calcium regulates the rhythm of the heartbeat. Calcium is necessary for heart function, blood coagulation and muscle contraction. Calcium has a role in controlling blood pressure and may help prevent colorectal cancer, high blood pressure, heart disease, PMS and osteoporosis. Children with extreme calcium deficiency may develop rickets; a disease that causes deformed bones. Chloride is an electrolyte that works with potassium and sodium to keep the fluid balance in and out of the body's cells. Chloride helps maintain proper blood volume, blood pressure, and pH of your body fluids and a component of gastric juice necessary for digestion. Chloride is also important for the proper functioning of the liver and for healthy joints and tendons. Copper, found in the bones, muscles, brain, heart, liver and kidneys, is an important trace mineral for the cardiovascular, nervous and skeletal systems. Copper plays a role in the absorption and metabolism of iron. Copper helps form connective tissue, nerve fibers and red blood cells; helps keep arteries flexible. Severe copper deficiency is rare. Too much zinc, may lead to a marginal deficiency with symptoms such as anemia, skeletal defects, decreased resistance to infection, heart disease, high cholesterol, nervous system disorders, lack of coordination and a tingling of the extremities. Fluoride is essential in bone and tooth formation and promotes the hardening of tooth enamel. In many parts of the world, fluoride is added to tap water. Studies have proven that this significantly decreases tooth decay in children, especially when it is consumed before the teeth emerge. Fluoride stimulates new bone formation throughout the life cycle, thus offering some protection from developing osteoporosis. It prevents acid and plaque formation in the mouth caused from food, especially sugar and helps the body retain calcium. Iron is found in many plants, but often in a form that is difficult to absorb (some iron-rich vegetables like spinach also contain oxalic acid, which interferes with the absorption of iron and other minerals). Vitamin C greatly improves iron absorption. Iron binds with hemoglobin molecules to transport oxygen from the lungs to the cells in the body. It is involved in enzyme activities related to energy storage and availability and for storing oxygen in muscles. Iron deficiency can lead to anemia, which causes lethargy, poor concentration, pale skin and shortness of breath. Vegetarians have to ensure they get an adequate iron intake, as do menstruating or pregnant women. Lithium has been used since the 1960’s for treatment of those who suffer from the psychological disorder of manic depression or bipolar affective disorder. Lithium acts on a person's central nervous system (brain and spinal cord). Physicians don't know exactly how lithium works to stabilize a person's mood, but it is thought to help strengthen nerve cell connections in brain regions that are involved in regulating mood, thinking and behavior. Hundreds of enzymes require magnesium ions to function. Magnesium compounds are used medicinally as common laxatives, antacids; vital for nerve conduction and muscle contraction. Magnesium is involved in the formation of bone and teeth. It activates enzymes that aid in the release of energy from food; helps control blood pressure, regulate body temperature and maintain the acid-base balance in the body. Calcium and magnesium must be in proper proportion to perform their closely related body functions. For example, calcium stimulates muscles while magnesium relaxes them. Magnesium has had some success in treating migraines, asthma and diabetes. Manganese is necessary for development, metabolism, and the antioxidant system. Manganese may play a role in treating heart arrhythmia, osteoporosis, epilepsy and back pain. The essential minimum intake is unknown since manganese deficiency is so rare. The human body contains about 12 mg of manganese, which is stored mainly in the bones. Manganese is used in bone formation, muscle coordination, nervous system function and is involved in several enzyme reactions. Potassium is important in neuron (brain and nerve) function, a major nutrient in fruits and vegetables and is the predominant positive electrolyte in body cells. To avoid high blood pressure, try to keep your potassium to sodium intake at 5:1 ratio. Potassium helps maintain blood pressure and muscle contraction. In partnership with chloride, potassium helps maintain the water balance in and out of body cells, and regulates blood pressure and heartbeat. It stimulates the kidneys to release toxins from the body. Diets high in potassium can reduce the risk of hypertension and may help to prevent strokes. Silica is considered important in the growth, strength, and management of many connective tissues. This applies to hard connective tissues such as bone and tooth and is suggested to play a role in the biochemistry of the subcellular enzyme-containing structures as well. Sodium is an electrolyte that plays a crucial role in regulating fluid levels and maintaining blood pressure. In tandem with potassium and chloride, it regulates acid-base balance in the body. Sodium is involved in nerve transmission and muscle contraction, including the heartbeat. Many conditions including congestive heart failure, liver failure, kidney failure and pneumonia are commonly associated with a low sodium concentration in the blood. This state can also be caused by overhydration from drinking too much water because of excess thirst and not replenishing the body’s sodium level. Exercise-associated hyponatremia is common in marathon runners and participants of other endurance events. Recent studies suggest Sulfate promotes a laxative effect and decrease in gastrointestinal retention of food at concentrations of 1000–1200 mg/L. Zinc is an important antioxidant that supports healthy immune system function. Studies suggest it protects against accelerated aging of the skin, muscles of the body and is an effective treatment for an age-related eye condition called macular degeneration. Zinc is a component of insulin and over 100 enzymes, proteins, nucleic acids and hormones. It helps in the healing of wounds, tissue repair, growth, energy conversion and sexual development. It regulates blood sugar, blood pressure, heart rate and cholesterol levels.